In just a few years, CAR T-cell and other adoptive T-cell therapies have emerged as among the most promising forms of cancer immunotherapy. But even as these agents prove themselves against several forms of leukemia and lymphoma—and, potentially, certain solid tumors—basic questions remain about how they work. In a study published online today by the journal Immunity, scientists at Dana-Farber Cancer Institute, Harvard Medical School, Vanderbilt University and colleagues at other institutions show how machinery within immune system T cells responds to outside signals and activates the cells to attack cancerous, infected, or otherwise diseased cells. The findings, based on 15 years of painstaking work to recreate and assemble key components of the signal-processing mechanism, may help researchers fine-tune T-cell therapies to the requirements of individual patients, the study authors say. 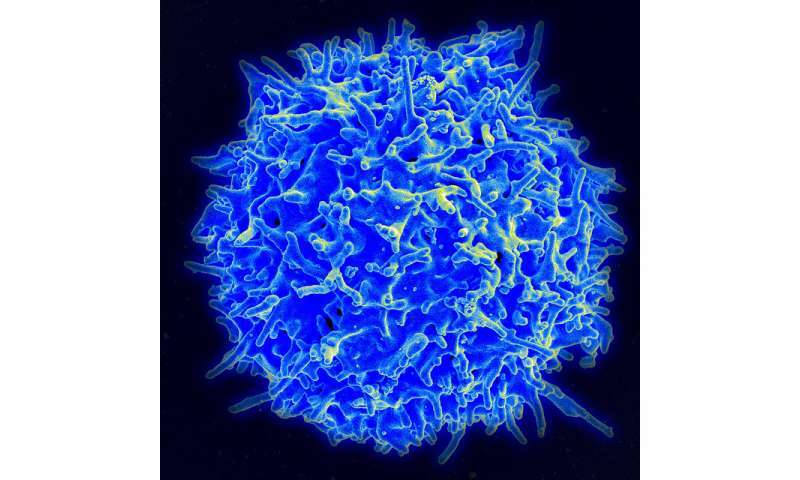 T cells, whose surfaces are dotted with structures known as T-cell antigen receptors (TCRs), patrol the body for signs of infection or other disease. As they keep watch, their TCRs lock onto bits of proteins, called antigens, displayed on protein structures decorating the surface of other cells in the human body. The antigens reveal whether a cell is normal or diseased. If a cell is diseased, these "protein bit flags" are recognized as "foreign" and, the T cell switches on, or activates, to kill the diseased cell. In CAR T-cell therapy, billions of a patient's T cells are removed and engineered to produce a structure called a chimeric antigen receptor, or CAR, that recognizes and latches on to a cancer cell. The resulting CAR T cells—essentially, high-performance versions of ordinary T cells—are then infused into the patient, where they take up the battle against tumor cells. Other TCR immunotherapies use genetically engineered T cells employing natural TCRs rather than chimeric receptors to target specific tumor cell antigens, also called neoantigens. Of note, in every healthy human being there are billions of distinct T cells each bearing unique TCRs and collectively capable of recognizing the myriad antigens that identify diseased cells. "While CAR T cells, and T cells in general, are often effective in identifying and killing tumor cells, the precise mechanism by which the TCR works hasn't been clear," says the study's lead author, Kristine Brazin, Ph.D., of Dana-Farber and Harvard Medical School. "How is the signal, which originates when the receptor links to a tumor antigen, transmitted through the cell membrane into the cell interior leading to cell activation?" "The assumption had been that this region, known as the transmembrane segment, was always straight," Brazin relates. "We found, however, that it is sometimes bent in an L-shaped formation." "We wanted to understand why this segment is sometimes embedded so shallowly in the membrane—in an L shape," Brazin relates. "We tried to make it straight." It was on the surface of the cell, however, that this bending and unbending made the biggest difference. When the transmembrane segment is in full L-shape, it presses tightly against the CD3 subunits at its side. When it unbends a little—as when Arg 251 was mutated—that tightness relaxes a bit, and the T cell enters an early stage of activation. When it becomes more fully immersed in the cell membrane, the gap with CD3 widens further and the T cell enters a later stage of activation, ready to attack tumor cells. "The looser the connection between the transmembrane segment and CD3 subunits, the higher the state of T cell activation," Brazin remarks. "Our findings suggest that the mechanical force of the TCR's interaction with antigens during T cell movement initiates T cell activation by weakening the connection between the transmembrane segment and CD3." "This study represents a success of multidisciplinary basic science, explaining how bioforces involving antigen recognition initiate TCR signaling through the T-cell membrane with potential for future translational impact," says the study's senior author, Ellis Reinherz, MD, Chief of the Laboratory of Immunobiology and Professor of Medicine in the Department of Medical Oncology at Dana-Farber and Harvard Medical School. "A special scientist such as Kristine Brazin with tireless persistence, focus and intellect was required to solve this mystery over more than a decade of research effort," he added.